1. CRACK HEAD DISEASE: This is the most common catfish disease in ponds. The cause of this disease is not yet understood unlike earthen ponds and natural water bodies, although adverse water quality due to over feeding is believed to be the main factor and also unbalanced nutrients in the diet of the food. Distended abdomen due to septicemia and hemorrhage. This disease can detected at early stages, affected fish show reddish lateral line on the skull between the two air chambers, as soon as this symptoms is observed in some fish during sampling, feeding should be substantially reduced and pond water should be replace. Generally, the fish recovers after few weeks after which feeding can be increased little by little. N/B: At the final stage of the disease the skull will break laterally followed by death. 2. WATER QUALITY DISEASE: Oxygen deficiency is a major cause of suffocation and mass mortality in pond. It occurs when the weather suddenly becomes hot, or the air temperature rises and reduces the solubility of the oxygen. For ponds, excess mud should be removed after each culture period. Fish tanks should be line-washed at the rate of 225-275kg1ha after each culture period, aerators may be used to increase oxygen level. 3. GAS BUBBLE DISEASE: This is caused by oxygen saturation in the water resulting to rapid increase in algal photosynthesis. 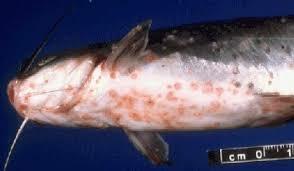 Small bubbles accumulates on the fish, intestines, skin, and filaments causing the fishes to float. The addition of fresh water and fertilization to the ponds will curtail the incidence of the oxygen super saturation and gas bubbling. 4. SCOLIOSIS: This is a skeletal deformation of the fish body, Which is cause due to high concentration of heavy metal and acid in water. This can also be caused by mineral deficiency like calcium, phosphorus, vitamins like vitamin C can also result to skeletal deformation of fishes like embryos, fry, fingerlings. Block wall tanks, newly constructed fish tanks must be allowed to cure for 30-35days (4-5weeks) with any animal manure in bags placed inside ponds to reduce the acid effect of cement used in plastering the interior pond wall or use dry grasses and shrub in the pond and allow it to ferment with water inside for 15days (2weeks). Dugout pond: These must be allowed to settle, limed and fertilized according before stocking fingerlings in addition. Feeds must be balance with adequate calcium and phosphorus. 5. 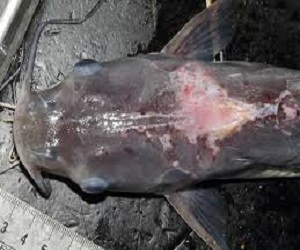 RUNNING HORSE DISEASE: This is another disease common in catfish farm, here affected fish usually swim violently in groups around the side of the pond. The stocking density of fry must be control by draining part of the fish tank water every other day. 6. 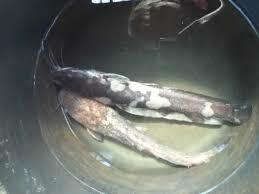 ANAEMIA DISEASE: Affected fishes are black with big head and small bodies. This is attributable to overcrowding and food shortage etc. Black gill filament covered with mud or mucus. Inflammation and hyperemia are visible inside the opercula. Table salt (Nacl) at a concentration of 2-2.5% for 10-15 in 20litres of water. furazolidone 0.2g mixed will feed or oral administration 0.5kg/100kg for grow out fish or 1kg/1-100kg fingerlings. N/B: this medication should be applied for 4-5days .